When I discovered Stir sweetener my baking life literally changed. I was scrolling through Instagram and I found Stir by chance, I was immediately drawn to the brand, LA look and the ingredient list. It was just what I was looking for: a natural sweetener with benefits: coconut sugar + prebiotic fiber that lower the glycemic index. This sweetener has been my favorite for a long time and it bakes so well! It is a perfect 1:1 substitution to sugar by volume not by weight. I loved Stir from the moment we met but even more awesome was meeting Leila the owner who besides being lovely (and gorgeous!) is also a foodie and a great baker and she shared with me her life changing chocolate chip cookie recipe made with Stir (grab that recipe on her Instagram account) which I immediately ran home to make (I just substituted flour for spelt flour). 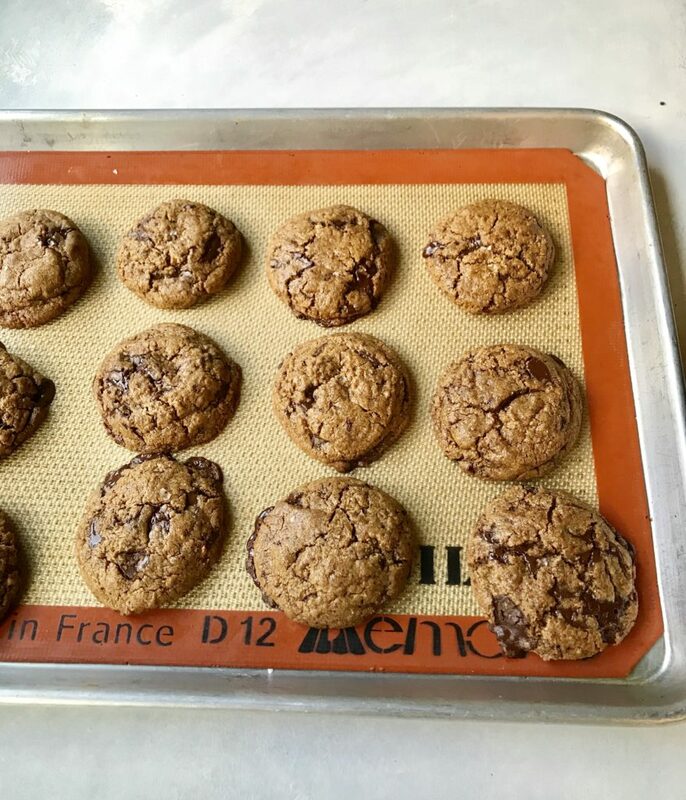 It then became my go to chocolate chip recipe and since I have been baking many paleo recipes I converted it to make these paleo chocolate chip cookies. These have become a signature recipe in my classes and workshops! They are amazing freshly baked! Preheat oven to 350 F degrees. Prepare a baking tray with a Silpat (silicon liner). In a large bowl mix ghee + Stir with a whisk by hand until well combined. Add the vanilla and eggs and mix until incorporated. Combine dry ingredients: flours, baking soda, and salt in a separate bowl. Whisk together until blended. Add the flour mixture to the butter mixture on low until blended. Don’t over mix. Add in chocolate chunks and mix. Shape cookies with a #24 scoop. Drop onto a cookie sheet lined with a Silpat. Refrigerate for about 10 mins. Bake 7-8 min for chewy cookies, 9-10 min for crisp cookies. Remove from oven and cool for 10 min on the hot cookie sheet. Remove and place cookies onto cooling racks or perforated baking trays to cool completely. You can make half the recipe perfectly well. Vane, buenas noches espero te encuentres bien ya en casita, respecto a las galletas, tengo una duda sobre el azúcar que utilizaste Stir Sweetener, con que azúcar la puedo sustituir, acá, ya estoy queriendo hacer mis galletas para mi familia. ¿podría ser azúcar de coco ó monk fruit en la misma proporción? Por otra parte, estaba mas que puesta para ir a tomar tus cursos de septiembre pero tuve un contratiempo con la casa, prácticamente tuvimos que levantar todo el piso nuevo de mi baño completo por fuga de agua y esa fue la razón por no poder asistir con todo el dolor de mi corazón, pero hay mas tiempo que vida, y amenazo con estar en algunos, te quiero mucho y me siento feliz de tu éxito, y gracias por permitirme seguir aprendiendo más de ti, un fuerte abrazo, mil bendiciones. P.D. Saludos a tu esposo y a sus hijos . Mil abrazos y bendiciones. Usa azúcar de coco misma cantidad. Abrazos! Hola Vane, se ven buenísimas esas galletas y quiero hacerlas ya, me brinco la duda respecto al arrowroot, en ¿México donde puedo encontrarlo?¿O cómo lo puedo sustituir? Muchas gracias por tú trabajo. Hola Lilian, en cualquier tienda orgánica. No se puede sustituir. Abrazos! Hey Buddy!, I found this information for you: "PALEO CHOCOLATE CHIP COOKIES". Here is the website link: https://www.vanessamusi.com/paleo-chocolate-chip-cookies/. Thank you.